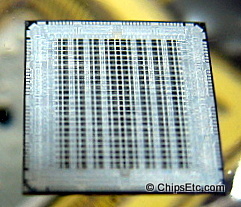 Specialty: Major player in the development & production of computer hardware, transistors, semiconductors, hybrid IC's, EPROM & RAM memory, Microprocessors, & software. 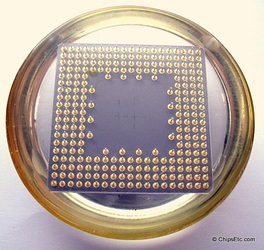 World's first "all Integrated Circuit" computer, the Fujitsu FACOM230-60. This tie clip contains an actual Fujitsu Integrated Circuit logic chip embedded on it's front. 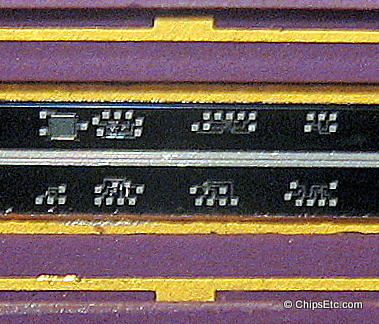 Tie clip has the Fujitsu logo & is stamped "Silver" on the back. 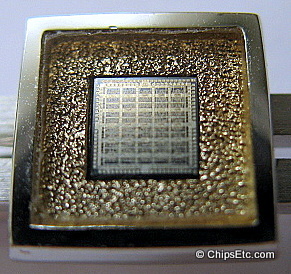 Similar logic chips made by Fujitsu were used in air-cooled Amdahl computers during the mid to late 1970's. 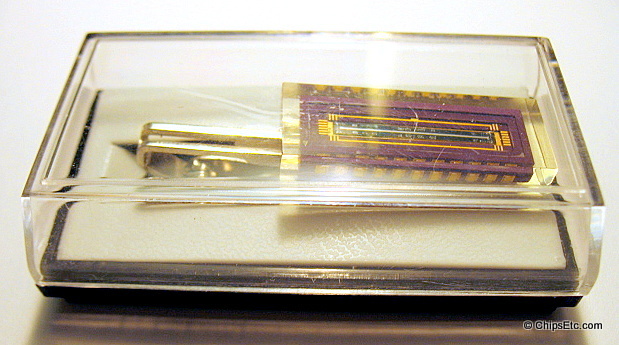 Tie Clip from Fujitsu Laboratories Ltd. (Kobe, Japan) featuring a new type of 1024 element linear image sensor developed using a CCD with a meander channel (MCCD). 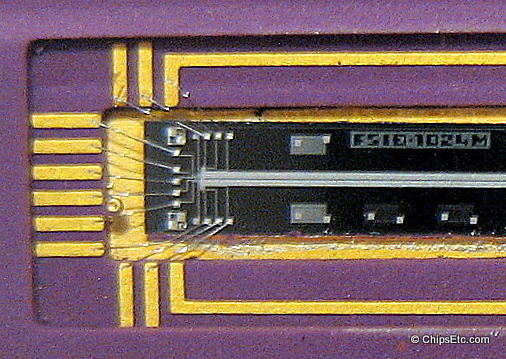 CCD chip in purple ceramic & gold packaging, embedded in Lucite, chip silicon reads "FS10-1024M". 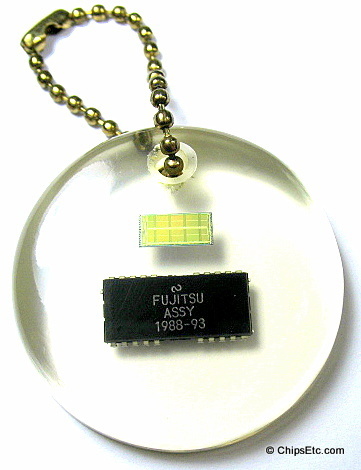 Back of lucite inscribed "MCCD Fujitsu Lab". 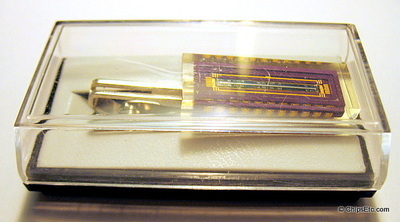 New, Comes in original presentation case. 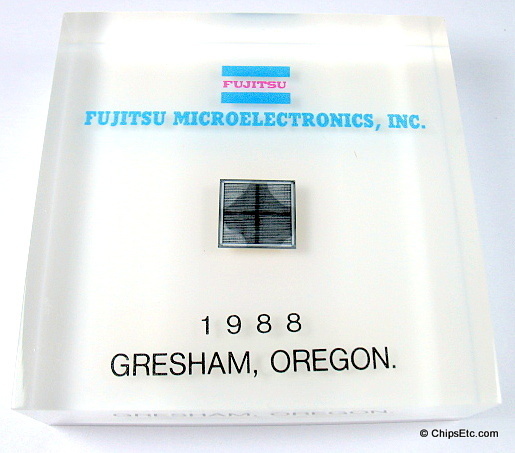 Lucite paperweight featuring a Fujitsu DRAM memory chip manufactured at their newly opened Gresham, Oregon Fab. 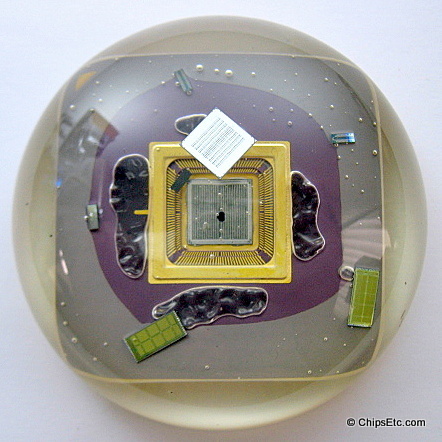 The 826,500 sq. ft. Gresham plant (200,000 sq. ft. of clean-room) first opened in Oct. 1988 and was Fujitsu's first U.S. wafer fab. 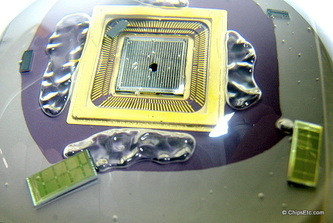 It would become one of Fujitsu's key sites for manufacturing of their memory products. 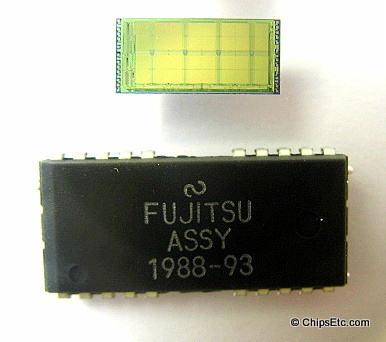 In April 2000 Fujitsu decided to exit the DRAM memory market and the Gresham plant converted all it's production lines over to the manufacture of flash memory. The 670 employee Gresham Plant was permanently shutdown in January 2002 and would later be purchased by Microchip Technology and become Fab 4. 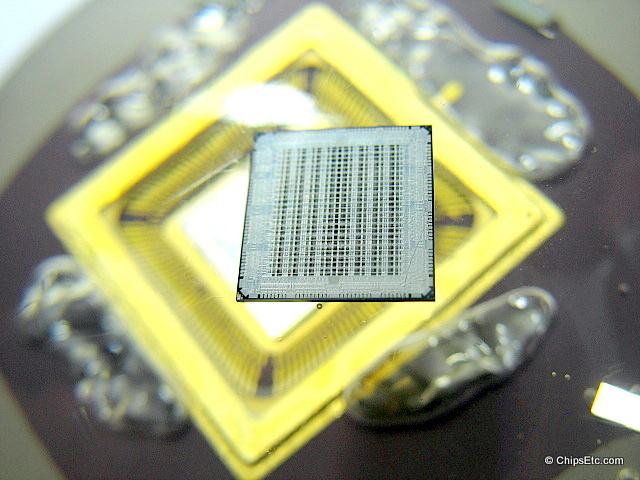 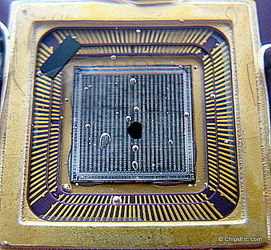 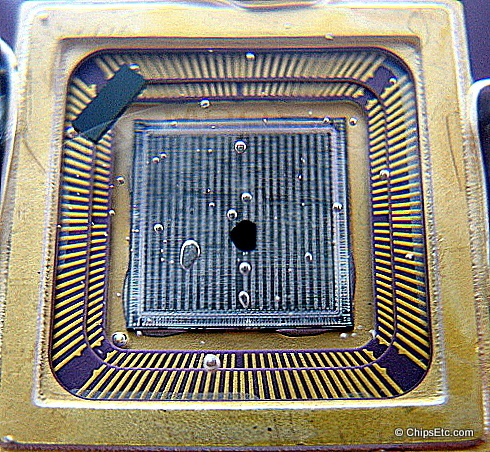 Silicon chip die is marked "c. 1984 2004 600UH567". 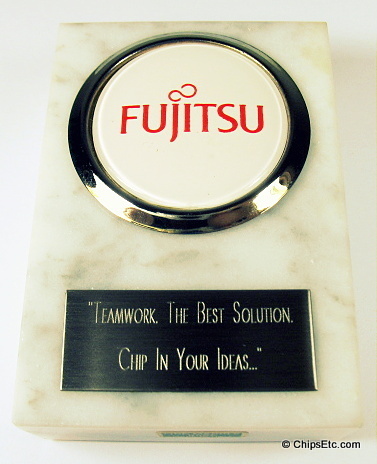 Marble presentation paperweight given to Fujitsu employees at their Gresham Oregon Fab. 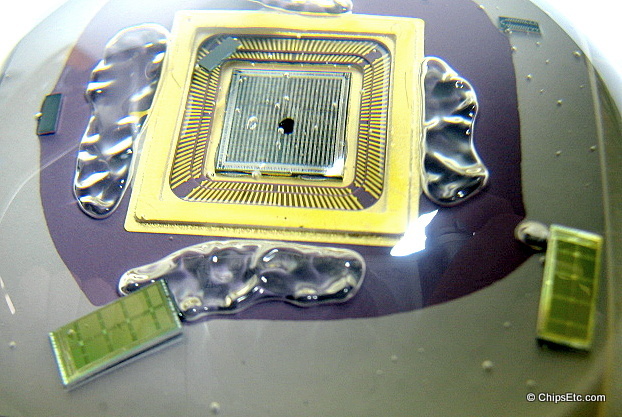 Placard reads "Teamwork. 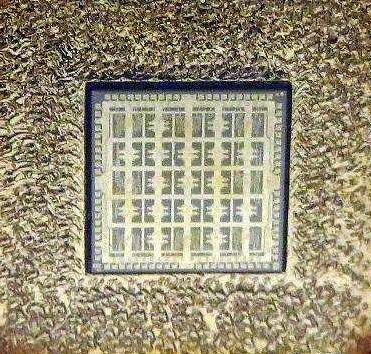 The best solution. Chip in your ideas..."
Lucite keychain featuring a Fujitsu DRAM memory chip die, and the finished assembly in plastic packaging, manufactured at their Gresham Fab & Assembly plant. The completed memory chip package is custom marked "Fujitsu ASSY 1988-1993". 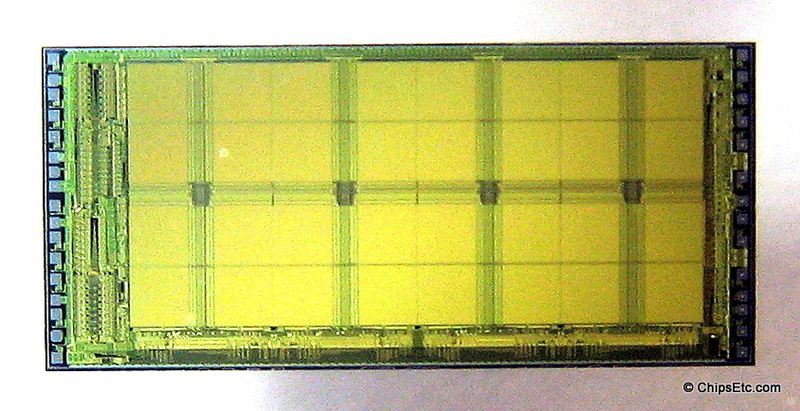 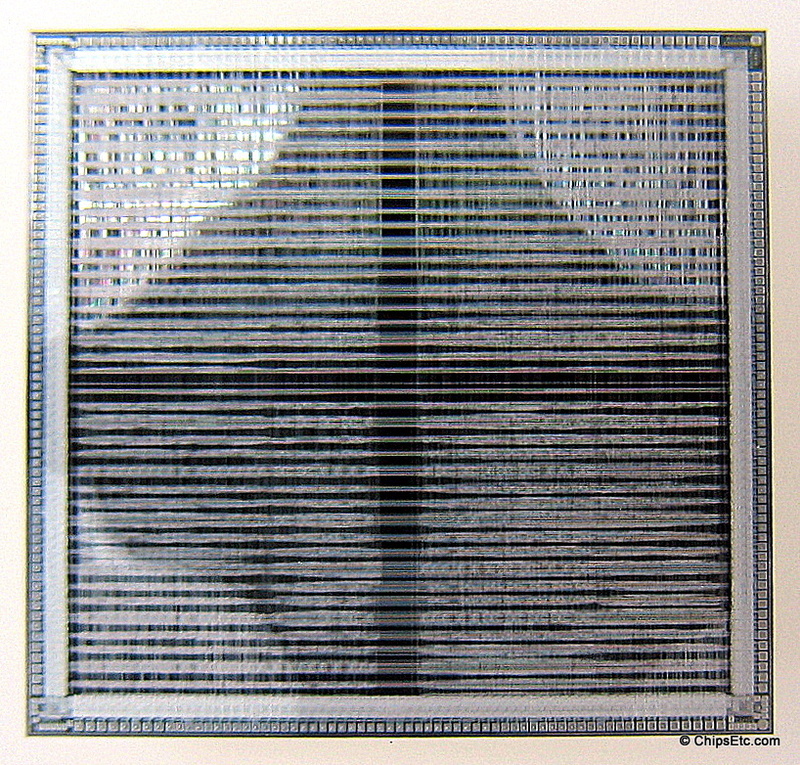 The silicon chip die is marked "Fujitsu 81C1000A", which is a 1M bit Fast Page Mode Dram. 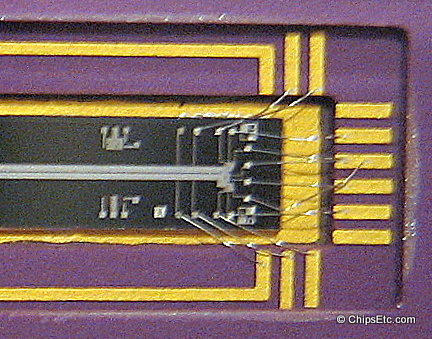 The accompanying finished version of the chip is a 20-lead SOJ (Small Outline J-lead) package. Lucite dome paperweight features various examples of silicon memory chips manufactured by Fujitsu, as well as a Fujitsu SPARC workstation CPU in ceramic and gold PGA packaging with it's lid removed to allow for viewing of the CPU die. 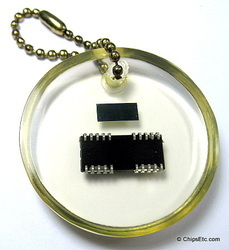 This promotional keychain features a Fujitsu Microelectronics "TurboSPARC" CPU chip embedded in Lucite. 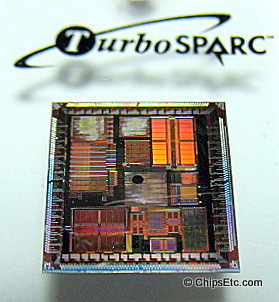 The 32-bit, 160 MHz, Fujitsu TurboSPARC CPU was originally offered as an upgrade chip for the Sun Microsystems SPARCstation 5 (SS5) line of 70, 85 and 110 MHz microSPARC-II based low-end workstation computers. 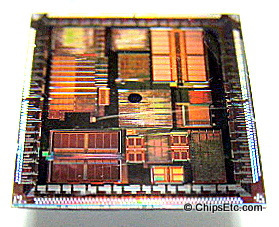 The Fujitsu upgrade kit was capable of improving the SPARCstation 5 computer's performance by 200 to 300% over it's original Sun Microsystem's 110 MHz microSPARC-II CPU. 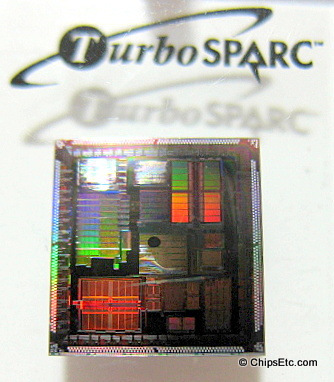 A 170 MHz version of the TurboSparc CPU would be used by numerous computer manufacturers in 1997, including use in Tadpole Technology's "SPARCbook" 3XT & 3000 models of high-end workstation / server class notebooks, and were also found in SPARC based computers from Opus Systems, Tatung Science and Technology, Themis Computers, Force Computers, Fujitsu Computers, RDI Computer and others. The 3.0 million transistor TurboSPARC CPU featured 256KB of external Level 2 cache, and was manufactured by Fujitsu Microelectronics using their 0.35 µm "CS-60ALE" CMOS process​. 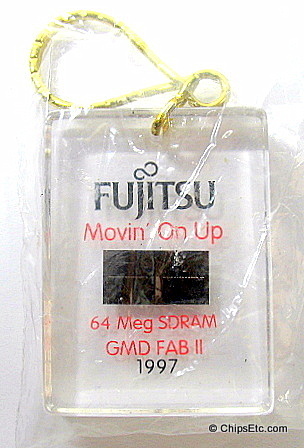 Lucite keychain features a Fujitsu 64 Meg SDRAM memory chip manufactured at Fujitsu Microelectronic's Gresham Oregon Manufacturing Division (GMD) Fab II. 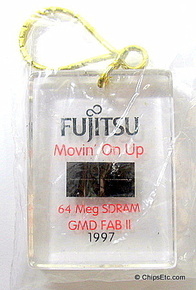 ​Reads "Fujitsu Moving on up". 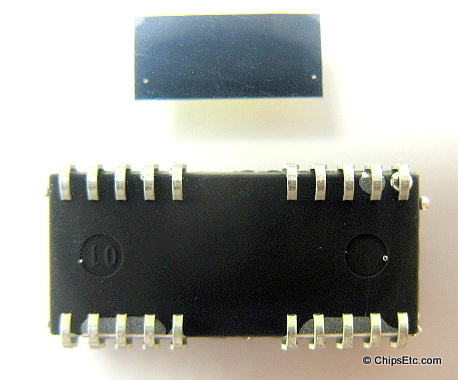 New, unused in original sealed package.